You can go to my flickr stream to see the links to all these images, if you want. 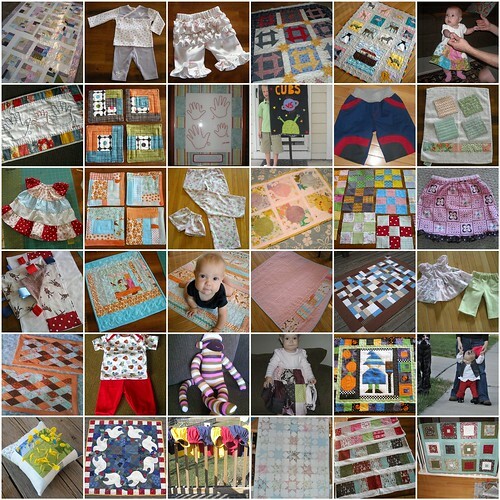 I made lots of coasters, 5 mini or smaller quilts, 3 throw-size quilts, 3 baby quilts. I quilted 2 additional quilts for my mom. I also made lots of dishtowels, some clothes for my kids, some bags, and other things too. I'm happy to be finished with my Christmas sewing and my final quilt of the year--I got the binding all done while watching New Year's Eve shows on TV last night. I feel like I can make whatever I want to right now, and I have several little girl clothing items that I've been dying to get started on. I'm looking forward to a great 2010! This is so cool to see! Especially since I didn't start reading your blog until recently. I'm still in love with your figgy pudding quilt. Is that a pattern or did you just make it up? Did I already ask you that? Wow Vicki, you have had a very productive year! 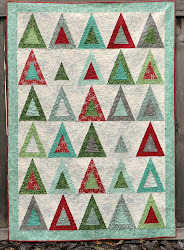 Love your blue/orange quilt mid year! Your projects are all darling! I love the little monkey! :) Happy New Year! You are amazing! And I love my dishtowel and coasters; use them all the time. Here's to a fantastic 2010! Great collage Vicki! Happy New Year! Wow! Sew awesome! I love seeing all of your talent and discipline laid out like this in a beautiful collage.